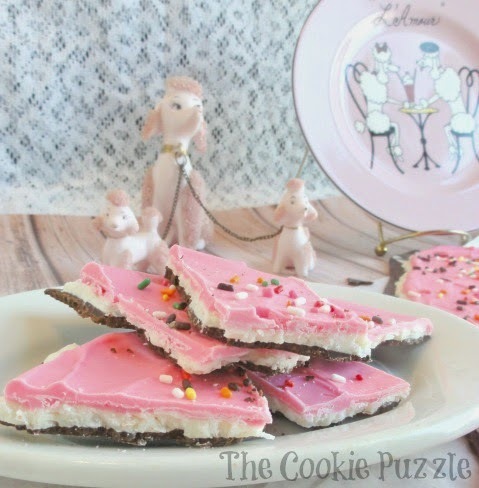 On the first week of every month, one thing that I always try to do is join in on the Inspiration Challenge, hosted by Ellie's Bites Decorated Cookies and Simply Sweets by Honeybee. 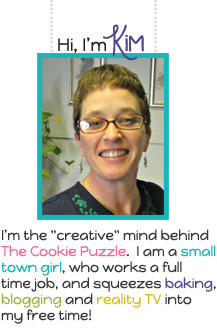 Each month they have a theme, and they encourage you to create something following that theme. I say TRY because last month, I totally dropped the ball and did not join in on the fun. Well, this month, I was a good blog friend and made something for the Challenge. Can you guess the Theme for this month? Any ideas? Anyone? Hello? Tap Tap Tap. Is this thing on? Ok...fine...if you have not guessed, the theme this month is PARIS! I don't know about you, but when I think of Paris....the first thing that pops into my mind is Pink Poodles! Why is that? Do people in France own Pink Poodles? Now, I know Pink Poodles are not a real thing, kinda like unicorns, if they are pink, their owners dyed them pink for a dog show or photo shoot or just because they like pink or...whatever, but to me...Pink Poodles are Paris. The other thing that I think of when I think of Paris/France is Neapolitan Ice Cream. Is that even a french thing? 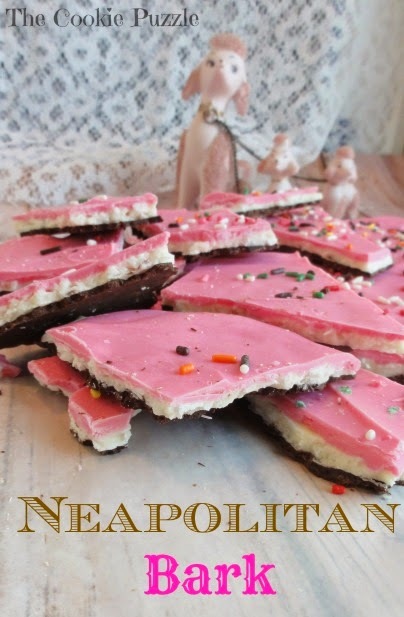 I have no idea...but in my small town Mid-American mind...Neapolitan is French! I love Neapolitan Ice Cream...I used to HATE the strawberry when I was young, but now it is my favorite! 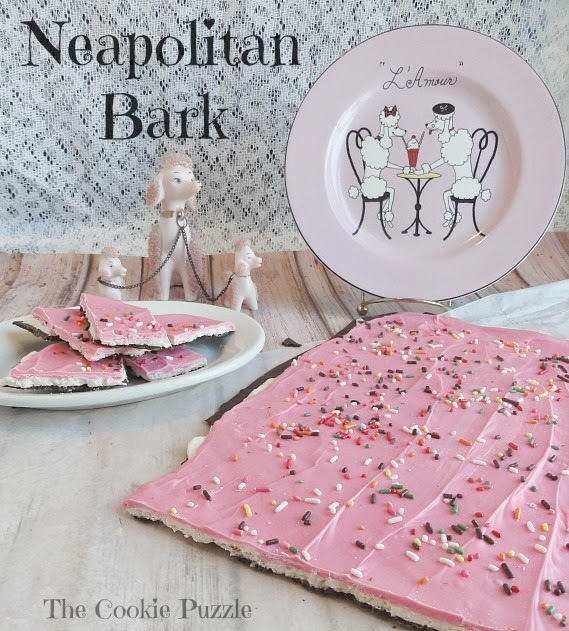 So...given my limited knowledge of Paris, I make Neapolitan Bark and put some pink poodles in the pictures. This Bark is super easy to make, so I am not going to bother with a printable recipe, but I will share how I made it. Line a baking sheet with waxed paper. Melt the Chocolate Chips, the dark chocolate chips, according to package directions. Pour onto waxed paper and spread out evenly, you want a pretty thin layer, as you will be adding two more layers on it. I used a 1/2 sheet pan, and spread it almost to the edges. Set aside to cool and completely harden. You could put it in the fridge to speed up the process, but I just waited a few hours. Once the chocolate is completely cool and hard, melt the white chocolate chips according to package directions, stir in coconut, pour over chocolate and spread out evenly, again, keeping the layer pretty thin. Allow this layer to cool/harden as you did in the previous layer. When the white chocolate layer is cool, melt the pink candy melts, according to package directions. Pour over chocolate/white chocolate layers, spreading evenly. Sprinkle with sprinkles....allow to cool/harden then cut or break and enjoy. 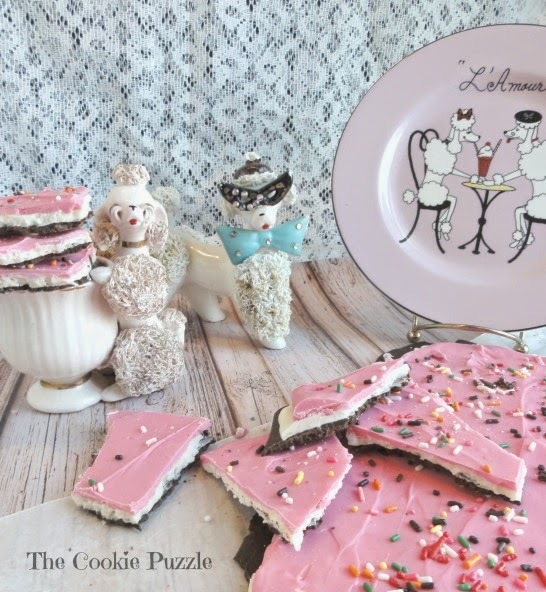 Oh...I want to give a great big shout out and thank you to my mom, Maga Cookie Puzzle, for letting me steal/borrow a fraction of her Pink Poodle collection. Aren't they just soo cute? Most of them are very old, she has been collecting them for as long as I can remember. She has a ton of them, and when I asked her if I could use them as photo props, she grabbed a box and told me to take all I wanted. As I was leaving, my dad, Papa Cookie Puzzle told me that if I take it out of the house, I could not bring it back..LOL. I think he is tired of a house overrun with my mom's collections. Make sure you head over to Simply Sweets by Honeybee to see all the wonderful Paris themed projects, and she is hosting a link party that is open all month, for you to link up your own creations. Your recipe looks good, and I love the poodles! They are so cute! That is too cute! Love it! My daughter will want this immediately Lol! love this.. they look so tasty... I don't play with chocolate that much, but I wonder if you could add strawberry flavored oil or something to the pink for a true Neopolitan experience. OOHH La La!!! Love reading what you are always working on. I need to jump in on these challenges. This looks lovely and delicious, I am going to have to try it. Neopolitan ice cream is my favorite too, I craved it when pregnant with my oldest son and have loved it ever since. Thanks for sharing with #SmallVictoriesSundaylinky. This is darling, and so pretty! What a great idea to layer the flavors! Great! Pink, white and chocolate brown are one of my favorite color combinations and I think it is due to me love of Neapolitan!! What a beautiful and fun treat! This is so adorable and tres chic -- I just love that color combo! I think my grandmother had those little poodles too. :) Thanks for sharing with everyone at Tasty Tuesdays!